Albert Alfred was born on 8 March 1883 (birth certificate number 1883/066601) in Aratapu in the northern Kaipara region. His early years are not known but we could expect them to be much the same as his siblings and for children generally of that time. Albert Alfred Stanaway -July 1918 – Australian War Memorial Collection A01691. The first record we have for Albert is his Boer War (1899-1902) SA War Records from 1902. At the age of 19, Albert enlists in the NZMR (New Zealand Mounted Rifles), Serial number 9087. Private – 10th Contingent, B Squadron, drafted from the Dargaville region (Aratapu), his trade is listed as Seaman. The Tenth (1251 total men) was formed as a response to the defeat suffered by British forces at Tweebosch on 7 March 1902. The New Zealand Cabinet set an example to the British Empire by deciding to send a 10th contingent in April. It sailed on the 19th of that month, arriving on 27th May, four days before peace was declared. The 10th contingents sailed for home in July 1902. He served only 127 days before the War was over we do not know if he saw any action in South Africa as it seems shortly after the 10th arrived the war was over. He was however, issued with an Imperial South African War medal and clasp. Weight: 11 st. 4 lb. On 6 November and 8 December 1903, Alfred writes a letter to the Defence Force from Katikati, it seems as though he and his sister Emily have moved to this area about this time. A further letter on 4 January 1904 we have Alfred in Rotorua, he had written a letter to the Defence Office in Wellington following up on outstanding pay from the Boer War. We do not know why he is now in Rotorua, his sister Helen does not appear here until 1920, however his late Aunt’s husband and family have moved here. Note – Each letter appears in different handwriting, it may be he could not write very well, and he had someone write them for him. In the 1905 Electoral Roll we have Albert living in Katikati still and working as a labourer. 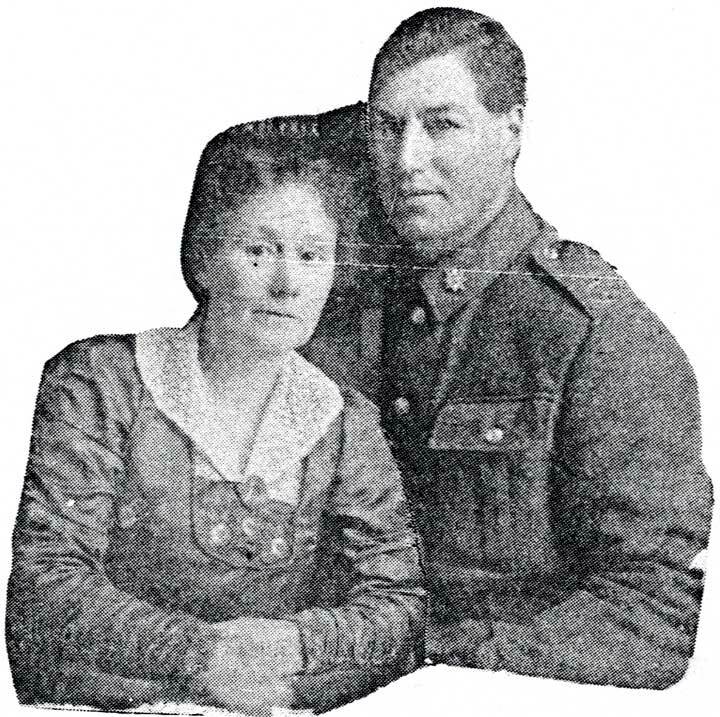 Albert and Ethel, shortly before his departure to Europe December 1916. – Tides of Time. On 7 July 1911,Alfred marries Ethel Maud Donald at the house of Mr Thomas Wilson, 55 Boston Road, Mt Eden, Auckland (Marriage Certificate number 1911/5586). This is Ethel’s second marriage, she has two children from her first marriage. The same year in the Electoral Roll they are listed as living at 55 Boston Road, Auckland and Alfred is listed as a mill hand, and Ethel as a machinist. Ethel is the daughter of William Donald a fireman and Lucy McGarth, and was born about 1878 (Birth Certificate unknown) we believe in New Zealand. Her first marriage was to Robert Percivial Davis in 1899. She had 2 sons with Robert, firstly Robert Edward (Ted) in 1900 then Frederick Donald (Don) in 1901. Frank Jamieson (Bert) was born on 9 October 1911 – he is listed as adopted by Alfred (Refer WW1 records). Around 1914 Alfred is working for the Auckland Racing Club, as a labourer (details from WW1 Record). He and Ethel were living at 67A Symonds Street, Auckland, which is next door to his parents. On 28 January 1916 Alfred enlists into the NZEF, he is 33 years old. He is posted with the 18th Reinforcements on 27 June 1916. While training at Trentham Army Camp he is admitted to hospital on 1 August 1916 with Influenza, he is discharged on 3 August 1916. He then disembarks from Devonport on 31 December 1916. During his time in the NZEF, Alfred gets promoted to Lance Corporal (October 1916) and demoted back to private (February 1917). He is posted with 1st Auckland Regiment on 20 April 1917, on 23 June 1917 he is registered as missing and then on 25 August 1917 he is listed as a Prisoner of War. This is confirmed in a publication on 30 August 1917. “Private Alfred Stanaway, previously reported missing, now reported wounded in left knee and prisoner of war in Lumburg, Alahu, Germany, was employed by the Auckland Racing Club prior to enlistment. He had also served in the South African war. As we can see he was at one point reported as missing, which must have alarmed his wife and his parents, as by this time, Charles his younger brother, had been killed in the Somme. Under an agreement made in 1916 between the Swiss Government and the French, British and German Governments, a number of wounded prisoners of war (POWs) were interned in Switzerland, Alfred was one of the soldiers shipped to Switzerland under this agreement – a relief to his wife and family I’m sure. Interned Australians, New Zealanders and Canadians, prisoners of war who have been transferred to Switzerland, who took part in the Aquatic Sports at Interlaken Switzerland, July 1918 – Australian War Memorial Collection A01691. 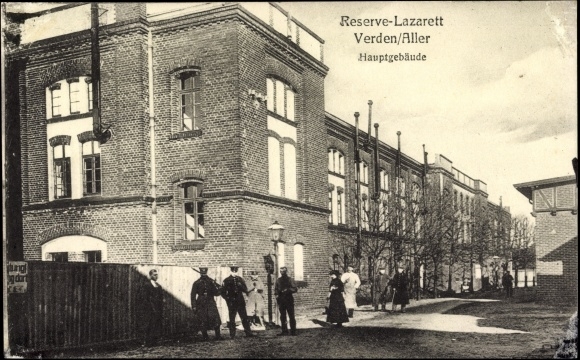 By July 1918 Albert has recovered enough to take part in the Aquatic Sports at Interlaken Switzerland in particular rowing. 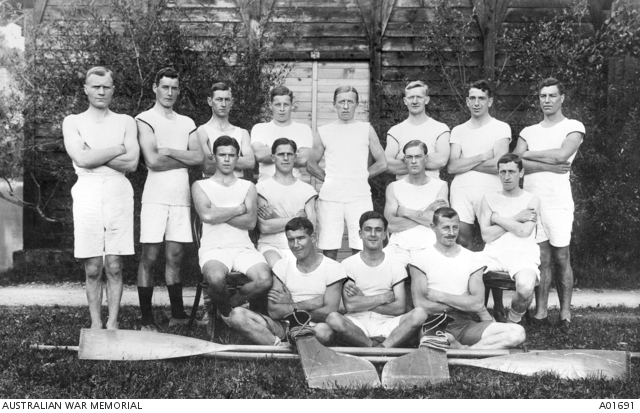 Interned Australians, New Zealanders and Canadians, prisoners of war who have been transferred to Switzerland, had set up an aquatic sports tournament. World War One was winding down, I am sure Ethel was looking forward to the return of her husband, and happy in the fact that he was out of harm’s way, but there was one more twist and a tragic one. He is buried in the Vevey (St Martin’s) Cemetery in Switzerland where a number of Commonwealth soldiers, who died in captivity, lie buried. The original grave was marked with a wooden cross which was later changed to a stone headstone. 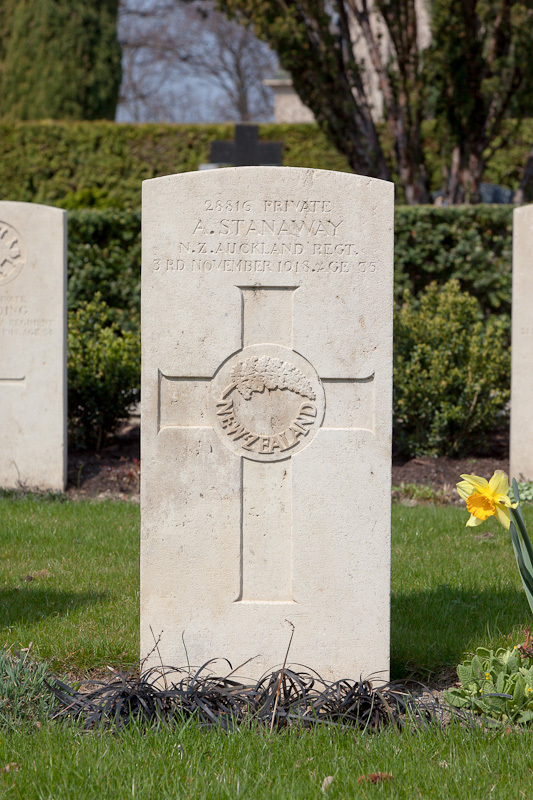 From the photograph of the original grave we see that he was not alone and perhaps a number of allied service men suffered the same illness and result (Death Certificate number 1918/24387). 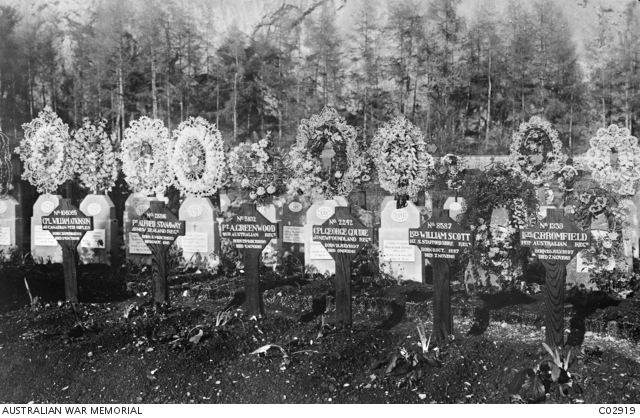 Vevey (St Martins) Cemetery in Switzerland – Albert’s Cross second from the left – Australian War Memorail Collection C02919. The impact on Alfred’s death was felt by his family for some time. In memory notices were still being placed in the Auckland Star up until 1937 by Ethel and Frank. Ethel does not remarry, and at the age of 83 Ethel dies in Auckland on 30 July 1961 and is buried at Waikaraka Cemetery Area 6 Block A Lot No 118.